History is full of tragic examples of the failure of people to express love. Some of these failures are attributable to individual attitudes, others to the postindustrial urban social structure that emphasized economics over humanity. In any case, it is people who are responsible. Lockean individualism glorified life, liberty, and property. Jeffersonian deism advanced the concept to guarantee life, liberty, and pursuit of happiness. Very soon the two were confused, and people came to seek happiness more through property than through gratifying human relations. For all their missionary fervor and Christian morality, there were great failures of love in the Pax Britannica and the Pax Americana, usually in the name of national and economic security. This is not to blame Britain or America. Japan is equally responsible for thoughtlessly imitating their imperialist expansionism and mass-urban industrialism. Now Japan too needs to analyze and rethink its own priorities, to clarify the causes of its present social malaise, and to improve and restore its own ethical culture. Only an impartial ethical standpoint can provide us with the ability and inclination to remove the causes of our alienation and unhappiness. The principle of harmony and humane love transcends time and place, providing spiritual nourishment and enlightenment for all. For love and harmony never betray us. Even when we personally fail or fall into evil ways, ethics itself does not change, and ethics itself does not condemn us; we always have the opportunity to correct and improve ourselves. The laws of nature accept all human beings – including weak and evil ones – and wait for their improvement. We can trust this as the eternal law of the universe. It applies not only to individual human beings, but also to society. Even if society pursues high technology and forgets love and harmony, the great power of love and harmony will continually care for the society and wait for its improvement. Because of this great generosity, we can trust ethics, and the love and harmony undergirding it. Even if some people forget and betray love, universal harmony continues to govern those heartless people. In addition, by selfless compassion, love and harmony revive many weak-minded people and arouse determination in their hearts. We need determination to love from the bottom of our hearts. Sometimes it is hard to talk about love and harmony to those who have many problems, who have weak or stubborn minds, or who have never experienced love and harmony. Only people who seek harmony, open their minds to love, or fill their hearts with peace can feel love and harmony. However, once we determine to love from the bottom of our hearts, to give up our past mistakes, love and harmony smile at us; they fill our hearts, transcending any words of explanation. When we are willing to love, a smile is already on our lips. Even a slight smile warms others’ hearts; it brings the light of love and harmony to others’ minds. We have spent too much time and money already in vain attempts to show off. We have struggled to prove ourselves by obtaining licenses and certificates, advanced education and higher degrees, high rank and status in our business and leisure organizations, luxurious houses, cars, and possessions. The trade-off has been that we have become overly concerned about others’ opinions and criticisms. Our fears to do wrong have shifted from the legitimate concern always to do right by everyone to the impossible concern always to please everyone. Contemporary Japanese have thus lost themselves in their self-consciousness. Adaptability is often praised as a great virtue, but if adaptability merely means trying to adapt to what everyone else wants us to be, then are we indeed a lost generation. To regain true happiness born of self-confidence, we must begin with determination to love others. This is a tall order, and many will find it difficult to put into practice. But without this commitment, we shall never advance either ourselves or our society toward a genuinely respectable ethic. Of course, it is easier to make this commitment in a supportive social environment, and that is just what our Practical Ethics Association  attempts to provide. We try to awaken those still sleeping in darkness to the necessity of loving others and help those already awakened to find practical ways of expressing their commitment to society. To arouse the interest of the unenlightened, we first have to point out that millions of people already commit themselves to ethics above all else. Many lost and weak-minded individuals do not know even of the existence of our great association dedicated to love and harmony. For many others, it is a great encouragement, not to say the beginning of enlightenment or salvation, just to know of its existence and activities. Welcoming them to our meetings, encouraging them to speak from the bottom of their hearts, developing accepting and warm human relations with them, we can help them rediscover the joys of human interaction and loving community, beyond material or financial concerns. A Japanese proverb says that young friendships sunder in a single quarrel. This is true not only of youth. Old people may be better at concealing their disagreements and pretending to be on good terms with each other, using smiles and flattery to preserve a front. We must not mistake this for the truly loving smiles and genuine appreciation our association teaches. Mere flattery is as guilty as conspicuous consumption of being more concerned with others’ evaluations than with their genuine welfare. Such shallow and superficial relationships are also quickly sundered by a slip of the tongue or an unfriendly gesture. Nothing is more disillusioning to a newcomer seeking friendship than a false or superficial façade of love and harmony. So it is particularly important that the ethics of our association be heartfelt, deep-rooted, and committed. The mission of human beings is to live in accord with the law of the universe by putting ethics into practice. The only real human progress worthy of the name is ethical: alleviating pain, hunger, poverty, and loneliness; moving toward increasingly sustainable harmony with the universe. Real progress means the expansion of love and harmony. The first step toward a more ethical social and environmental policy begins with our own lifestyles. The more we contemplate the psychospiritual problems of urban industrial society, the more evident it becomes that pure love and harmony are the only answer. They are not difficult to demonstrate, but simply require determination. We must discern the roots of love and harmony in ourselves and determine to reach out to others, freeing both ourselves and others from the barriers and boundaries of loneliness and false self-consciousness. This is the mission of our Practical Ethics Association: the promulgation of a universal ethic for human happiness and the harmony of our environment. 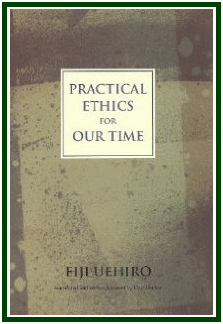 The above text is reproduced from the book “Practical Ethics for Our Time”, by Eiji Uehiro, translated and with a foreword by Carl Becker, Charles E. Tuttle Company, Singapore, 1998, 212 pp., see pp. 146-150. See more on Eiji Uehiro’s noble efforts in the article “No More Hiroshimas and Nagasakis”.